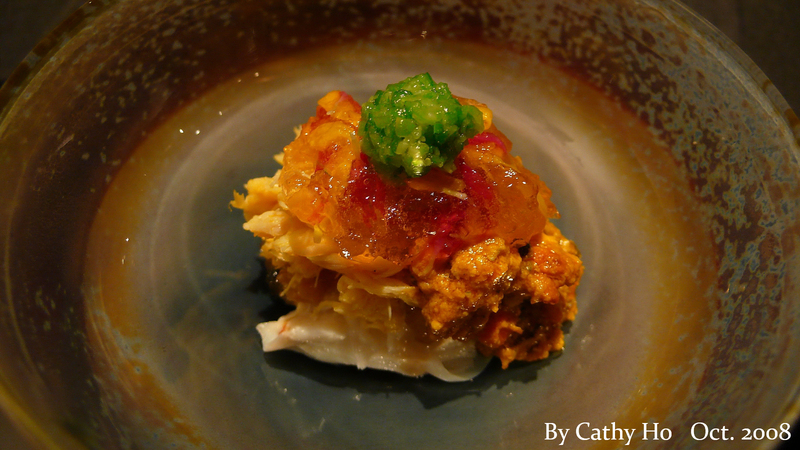 RyuGin, a restaurant renowned for creative Japanese cuisine, is hidden in the very modern and chic Roppongi area. The chef Yamamoto Seiji (山本征治) used to work under the very famous chef Koyama Hirohisa (小山裕久) at Aoyagi (青柳) for 11 years. 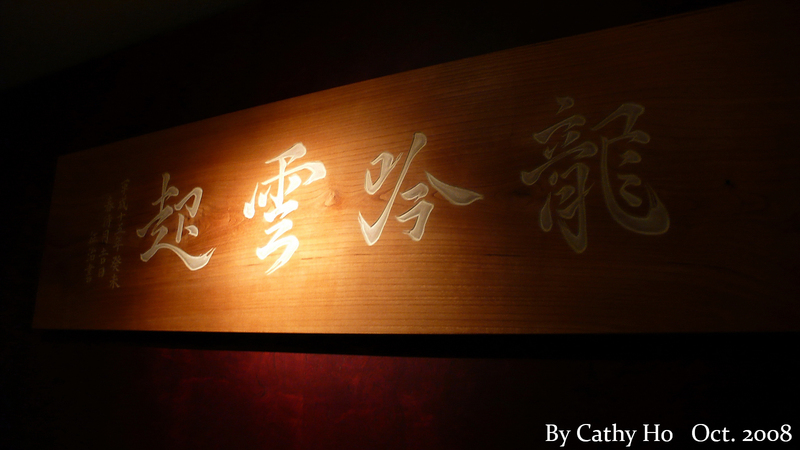 When he was 33 years old, he started his own restaurant RyuGin in December 2003. 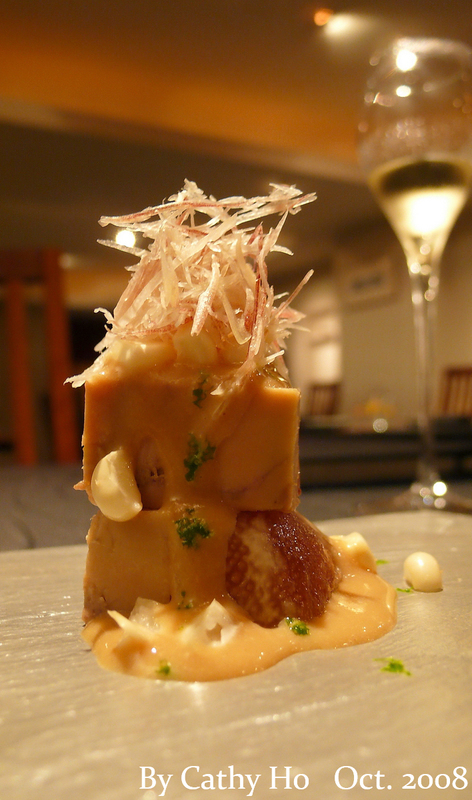 It’s rated as a 2-star restaurant by the first issue of Michelin Guide – Tokyo 2008. Yamamoto was invited to the 2007 Madrid Fusion and presented a dish called “Silkscreen of Squid Ink with Squid Carpaccio” which earned an ovation at the event. Indeed, Yamamoto is a super star in Japanese cuisine nowadays. The dining space of RyuGin is pretty small. The main space could host about 20 guests only, but with a private room, it can host up to about 26 seats. I was lucky to get a seat because I called to make a reservation just 2 days ahead, but I was requested to arrive at the restaurant at 18h, otherwise, there’d be no tables available until 22h. I knew it’s very difficult to get a table there, so, I told the person that it was fine for me to be there at 18h. On that day, I was the first guest to arrive at the restaurant. The sommelier (who was also the person to serve me) told me it would be okay to take a few pictures of the restaurant since no other guests were there yet. 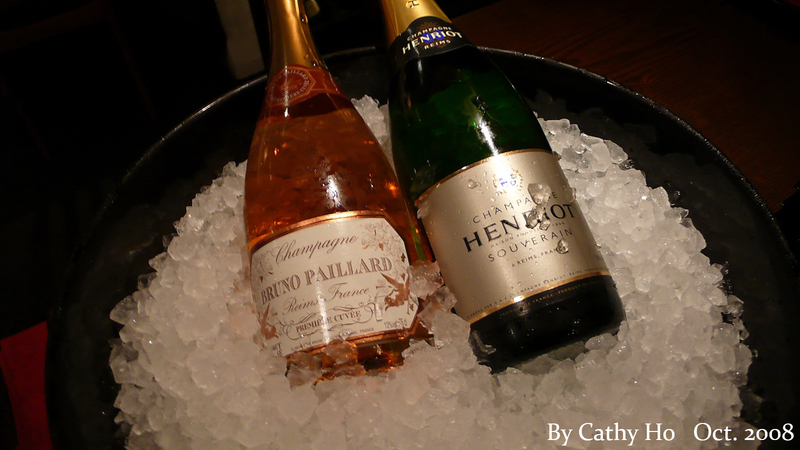 I was glad that the sommelier spoke English fluently. He told me that he went to Australia to take a sommelier course before, so there was no problem to communicate with him in English at all. Obviously, we have a shared interest – wine. Soon, we started a cheerful conversation. By his recommendation, I ordered the Gastronomy B set (which cost 26,250 yen, about US$250) which focuses on Yamamoto’s signature dishes. After having the seasonal amuse bouche, I asked the sommelier what kind of whites they provided by the glass. He soon brought 4 whites to my table. 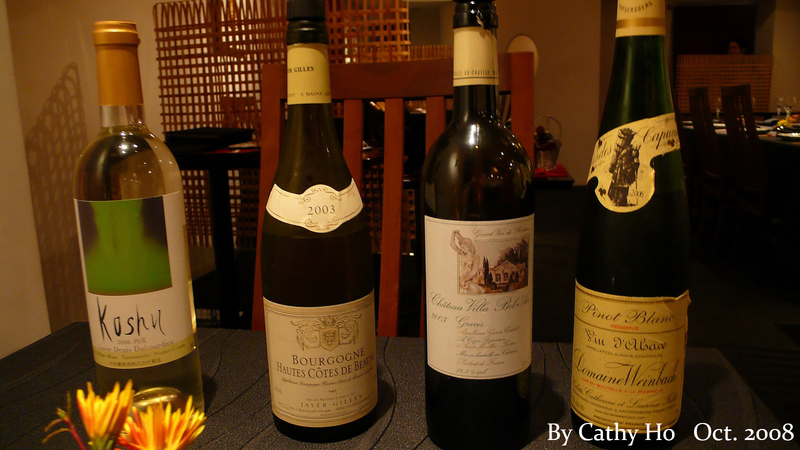 Normally, I would choose the wine by myself, but in this case – I didn’t know how this “creative Japanese cuisine” would be, so I preferred to consult the sommelier. Satisfyingly, he gave me this answer – “How about this – I’ll pour some of each wine for you, so you can try the different combinations with different dishes.” How could I reject this offer?! The sommelier was indeed helpful and friendly. He patiently explained every dish to me. When the “Assorted Sashimi – RyuGin Style” was served, the chef Yamamoto himself even came to pour the soy sauce for me as well as presented his greetings. Quelle surprise! When I dined at some Michelin 2-star or 3-star restaurants in Paris, I sometimes found some dishes were not executed perfectly which usually made me feel a bit disappointed. 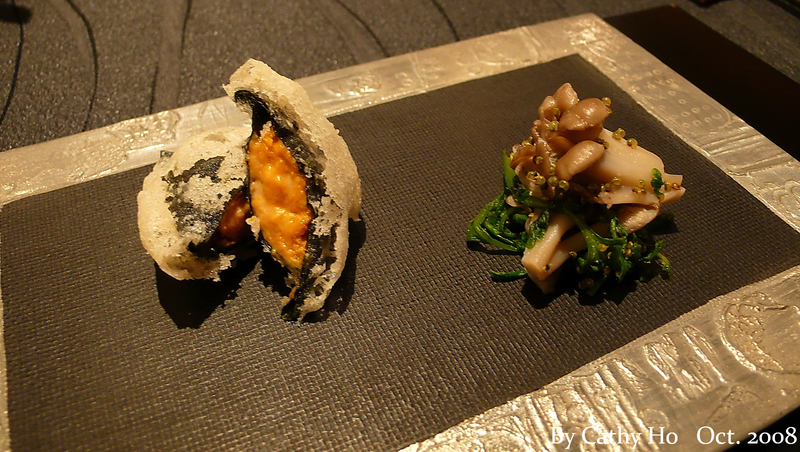 But at RyuGin, I would say – every dish just and simply blew me away. I didn’t find anything over-cooked or not executed properly. Plus, the ingredients were top quality and the service was inviting with a “Japanese” sincere touch. Instead of “words”, maybe the pictures posted here would tell better by themselves. You would understand what RyuGin is likely to be. 1) Amuse bouche – Ichiban Dash soup (Traditional clear broth) with puree of 5 varieties of wild mushrooms. 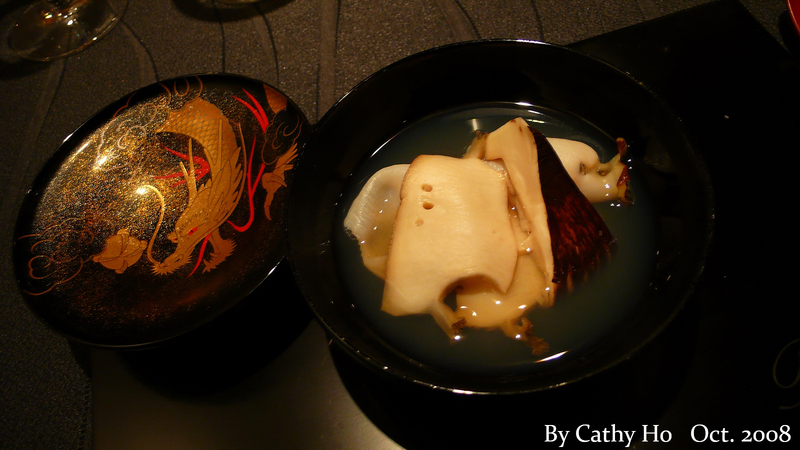 5) “RyuGin’s house special – Contrasted of two abalone pieces cooked differently, steamed for 10 hours and the other in Shabushabu.” – The more transparent one on the right side is cooked by “shabushabu” way. 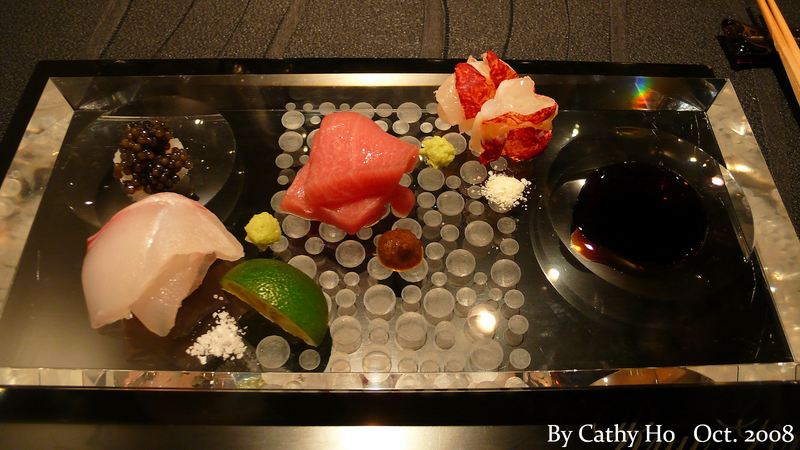 6) “Assorted sashimi – RyuGin Style” – There are 2 pieces for each kind of fish. For the first piece of each fish, the chef recommended me to eat with the sauce placed next to it. Then eat the 2nd piece with wasabi and dip a bit soy sauce. 9) “Chef’s specialty – Grilled baby pigeon with autumn truffles” – the baby pigeon was only 28 days old! The meat is so tender… It’s grilled perfectly. The autumn truffle is very aromatic which tells the quality. 12) Caramel ice cream with Wasanbon sugar served with grated milk curd” – Wasanbon sugar is considered the best sugar in Japan. I really like the flavor of grated milk curd. 13) Baked chestnut cake served on full-moon presentation – very traditional Japanese dessert. Interesting presentation. Thank you for sending the URL for your photographs. We have not heard of OAD website, and could you tell us the URL? s us as we are a tiny restaurant and don’t have the capacity for PR. We hope to see you again on your next visit to Tokyo.